Hatenboer-Water, in water since 1906, is the specialist in the field of maritime (potable) water. An up-to-date and sophisticated wide range of products, engineered systems and services provide the guarantee for this. With our specialist expertise, the application of our own engineering and design and a modern operating environment, Hatenboer-Water supplies cut-and-dried solutions for all your waterrelated problems. 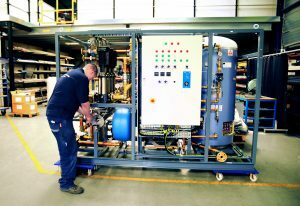 From the supply of a simple, standard product such as a pump or filter, right up to fully integrated custom-made systems, with all the necessary after-sales service.Our complete delivery programme and own engineering, workshop, warehouse and technical service means that we can offer swift, flexible and made-to-measure service.